It would be very nice to see this chart adjusted for inflation. The period of very low P/E's in the '70 & '80s corresponds to a period of high inflation and therefore low real earnings yield and so results in higher real P/E's. A series of real P/E's might show that the market is currently cheap compared to its historic average. 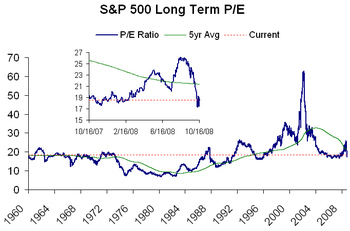 Anything less than Robert Shiller's data on PE ratios is a waste of time. isn't price quoted in current dollars as well as earnings quoted in current dollar so that when you divide one by other they would cancel, thus making inflation irrelevant. The reason that P/E is affected by inflation is that competing investments (bonds etc.) are returning higher rates. This depresses stock prices and thereby P/E ratios. You don't adjust PE ratios for inflation but inflation does affect what is an acceptable PE ratio. In periods of high inflation you can easily find high rates of returns elsewhere so stock prices drop, not being in great demand. Seriously, L, please update this with new commentary now that the TMM index P/E is 145-ish. Time to start investing in gold, ammo and canned goods?